From left: Kevin O’Malley, Brendan Carr, and Warren K. Zola, Boston College Chief Executives Club executive director. 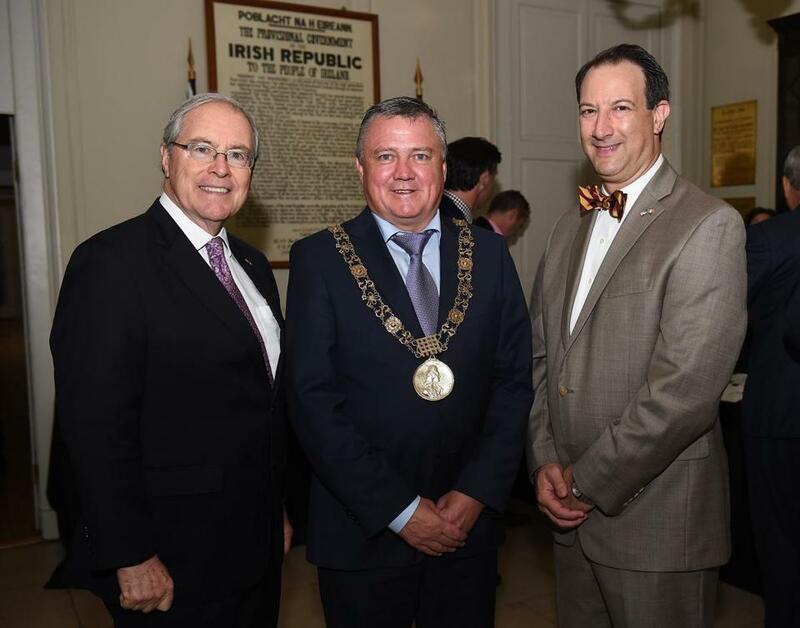 Approximately 400 people attended the inaugural Boston College Chief Executives Club Global Forum in Dublin on Sept. 2. Muhtar Kent, chairman and chief executive officer of the Coca-Cola Co., was the keynote speaker at the event, which was held at The Mansion House. Other notable attendees included the Rev. William P. Leahy, president of Boston College; Anne Anderson, ambassador of Ireland to the United States; Kevin O’Malley, the United States ambassador to Ireland; Neil Naughton, deputy chairman of Glen Dimplex; Joseph L. “Jay” Hooley, chairman and CEO of State Street; Georgia Governor Nathan Deal; Atlanta Mayor Kasim Reed; Lord Mayor of Dublin Brendan Carr; Georgia Tech president Bud Peterson; Aer Lingus CEO Stephen Kavanagh; Martin Shanahan, CEO of IDA Ireland; Julie Sinnamon, CEO of Enterprise Ireland; Mike Mahoney, president and CEO of Boston Scientific; John Fish, chairman of the Boston College board of trustees and chairman and CEO of Suffolk Construction; Jim Murren, chairman and CEO of MGM Resorts International; and Mike White, former chairman and CEO of DirecTV. The luncheon was part of a series of events leading up to the Aer Lingus College Football Classic, in which Boston College played Georgia Tech at Aviva Stadium in Dublin (and sadly, the Eagles lost by a score of 17-14).